It would have to deal with travel, be spectacular and a truly fantastic location. There are a lot of places that fit the bill, but I'm thinking of a place right out of a movie -- no, not "Casablanca" (although I would take it), or "Roman Holiday," (I've already been to the Eternal City), or maybe the locations involved in "French Kiss" but then again I've already enjoyed the City of Light. Think 'possibilities.' Think Czech Republic. Think Karlovy Vary. Think Queen Latifah. Think --- The Grandhotel Pupp. That's where I would like to spend some time -- of course, on someone else's dime. I think it would take a lot of dimes to stay at such a location but I could be up to it. Queen Latifah starred in the movie "Last Holiday" where she played a sales clerk in New Orleans who was led to believed she had a brain tumor and only a few weeks to live. She decides to fulfill her dreams and heads overseas to spend time at the hotel. When the movie comes on TV, it trumps just about everything else going on at the time. We've already watched it five or more times and continue to enjoy the plot line and her desire to enjoy to the fullest what she thinks is left of her life. She plays such a terrific part. Timothy Hutton plays the businessman you love to hate. The meals prepared by the hotel's world-renowned chef (Gerard Depardiue) are enough to get anyone to want to dine there. Snowboarding and basejumping are not my ideas of entertainment but the movie makes it a world of fun. In the original 1950 film, the leading character of George Bird was played by Alec Guiness. The updated story was for John Candy, but the project was shelved upon his death. Queen Latifah's agent read the script and suggested they revise it for her. I'm so glad they did. 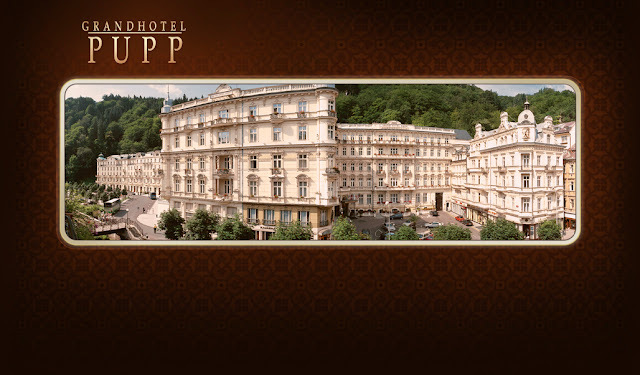 An internet site says a room a the Grand Hotel Pupp can be had for about 169 euros a night. I'm sure the presidential suite is out of sight. What do I want for Christmas? Think possibilities. Think a stay at The Grand Hotel Pupp.